The unique importance of the Temple Mount to Judaism and to Islam makes the location vulnerable to tensions and conflicts between Jews and Muslims. Usually, these incidents originate in rumors such as: “The Jews are coming today to bomb the mosques and build their Third Temple.” Obviously, false accusations and baseless suspicions such as these turn the site from a holy place of prayer and love into a site of violent political demonstrations. The potential escalation of tension brings on more restrictions and discomfort to all. Who benefits from this? Certainly not the worshippers. While the Israeli government ensures limited public access to the Temple Mount regardless of religious beliefs, only Muslims are allowed to pray at the site, which is known to Muslims as Haram al-Sharif. The Israeli government has prohibited everyone except Muslims from worshipping there since 1967, due to security concerns. Nevertheless, Muslims too are occasionally restricted. The Jordanian waqf, which administers the site, has restricted non-Muslims from entering the Dome of the Rock and the Al-Aqsa Mosque since the year 2000. What is more, non-Muslim religious symbols are not also allowed to be worn while entering the site. Wherever one prays to God is a house of prayer. Therefore, it is an atrocious thing to forbid anyone from praying at the Temple Mount. The longings of Bnei Yisrael to pray at the Temple Mount can never be an offense to a Muslim. On the contrary, it is very pleasant to see Jewish people praying at the Temple Mount. Indeed, all the faithful people should be able to pray there. As a matter of fact, in Istanbul’s Blue Mosque, Hagia Sophia and others houses of worship, foreign tourists often come and pray. Some perform their religious obligations according to their own faith, and it is something quite beautiful to see. As a devout Muslim, I take pleasure in seeing Jews pray to God, anywhere in the world. It would please me very much if they would be able to pray at the Temple Mount as well. As a devout Muslim, it would be a joy for me to see King Solomon’s Temple rebuilt as well. No, you did not hear me wrong. King Solomon’s Temple being rebuilt in all its magnificence and glory would be a great delight for me, as it would be for any Muslim. Under different circumstances, in an atmosphere of trust, love and brotherhood, Muslims would welcome this with enthusiasm. The Temple of Solomon is also a historically important place, and rebuilding it would be a wonderful occasion for all believers. Every Muslim, every believer will want to experience the spirit of those days again, and strive to bring the beauty of those days back to life. Actually, it is everyone’s aspiration for that city to be adorned, to be beautified, and to regain the magnificent glory it had in the days of King Solomon. Solomon’s Temple being rebuilt does not entail any harm to these shrines. So I beg my Muslim brothers and sisters not to take my words the wrong way. 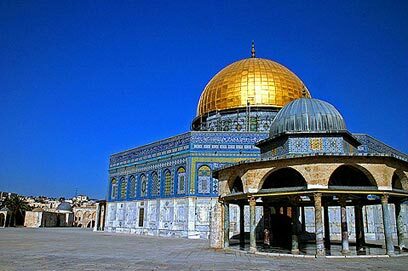 They should not be concerned, because the al-Aqsa Mosque and the Dome of the Rock will remain standing, as they are protected by God.There is a lot of space around the Al-Aqsa Mosque and the Dome of the Rock. The Temple can be built not far from Qubbat As-Sakhrah and Masjid el-Aqsa. King Solomon is loved by Muslims as well. He had a superior understanding of beauty and aesthetics, and no doubt, rebuilding his Temple in its original form would be a splendid undertaking. Decorated exactly as it was, with the same beautiful ornaments, covered in gold, adorned with fruit trees and beautiful gardens, and restored to its former glory, would be splendid! The very thought of Christians, Jews and Muslims cooperating to rebuild this house of worship, hand in hand, and worshipping there together, is uplifting. Think of the waste of energy and resources due to the conflict between Arabs and Jews. This energy could be used to beautify these holy places. There is plenty of space, and there are overwhelmingly sufficient resources for everyone to live there in peace and tranquility and enjoy their freedom of worship. How have we allowed these unending wars, sporadic clashes, security walls, unnecessary discrimination and restrictions to bar us from being able to embrace each other as brothers? Why do we assume that we are obligated to perpetuate these senseless conflicts? Why does everyone simply presume this is the way things are meant to be? We all want suffering to end and peace to prevail in the region. Obviously we cannot achieve this peace as long as we lack the spirit of unity. “And the foreigners who join themselves to the Lord, to minister to him, to love the name of the Lord, and to be his servants, everyone who keeps the Sabbath and does not profane it, and holds fast my covenant – these I will bring to my holy mountain, and make them joyful in my house of prayer; their burnt offerings and their sacrifices will be accepted on my altar; for my house shall be called a house of prayer for all peoples.” (Isaiah 56:6-7)Other prayer houses should be rebuilt as well, and Christians, Muslims and Jews should be allowed to visit them at the same time. The main entrance to the Old City is the Jaffa Gate. This gate was built by Sultan Suleiman the Magnificent in 1538. The name in Arabic, Bab el-Halil, or Hebron Gate, means “The Beloved,” and refers to Abraham. In the entrance hall of the gate there is a stone on which the following text is engraved: “There is only one God and Abraham is his friend.” It is written this way because Jews and Christians were also using this gate along with Muslims, and the text refers to our common belief in Abraham. So this should be the spirit in this site: We all worship the same God and we are all children of Abraham. Let us embrace each other with respect and love. Let us envision better days in which we can all pray, and unite in celebration and brotherhood in King Solomon’s house of prayer. I like your website. In fact, I shared some of your articles and added them to my FoxCAN Report. Please visit my website and give me your opinion.